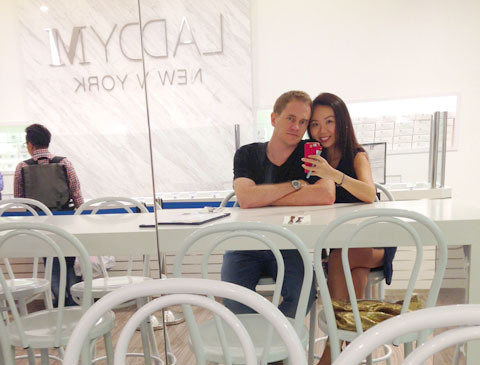 FOOD REVIEW: Lady M Confections Singapore @ Orchard Central | Beverly's Net: family. food. fashion. 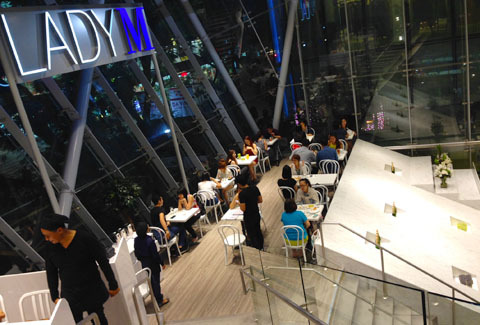 FOOD REVIEW: Lady M Confections Singapore @ Orchard Central – Beverly's Net: family. food. fashion. 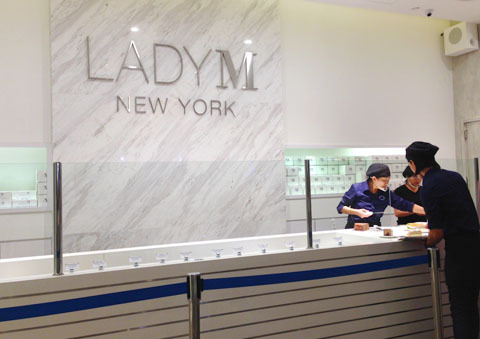 We were a little alarmed with the queue when we stumbled upon Lady M Confections one evening. 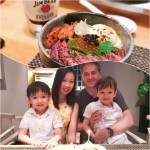 The decor was airy and bright, and the interior was gigantic (boasting killer views over Orchard Road), so we decided to try it out. Turns out everyone had the same idea. There was a long queue waiting for a table! Yet, oddly, the counter dining at the entrance was devoid of customers. So of course we did! I guess when you’re a middle-age couple that’s looking for a fairly quick meal (queuing is a big no-no) so you can scoot back home to your sleeping kids, a no-queue option is always the best option. We were happy. After all, it allowed us to people watch all the queue-rs and people going in and out of the cafe. So that, above, is the interior (mezzanine level) that people are willing to queue for. It’s definitely nice, and I’d do it if I was out for a long night with girl friends. It’s a huge space so you don’t feel crammed in, despite the place being a full house. 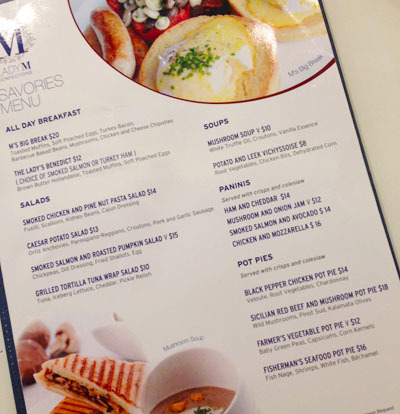 Their savory menu is basic, and features a few dishes that are easy for them to whip together (ie. no slaving over the stove churning out dishes cooked a la minute). 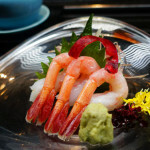 I didn’t have high hopes for their savories, as they are first-and-foremost a dessert cafe. But I was pleasantly surprised. We were recommended the Black Pepper Chicken Pot Pie ($14) by our friendly waiter. I was expecting a ramekin with the pie crust on top (ie. a pot pie), but their version is a regular pie. Not complaining though, I actually prefer it this way – more pastry! The chicken was very tender, and the black pepper was not overpowering. It’s supposed to have Chardonnay in it, as per the menu, but I detected zero trace of it. 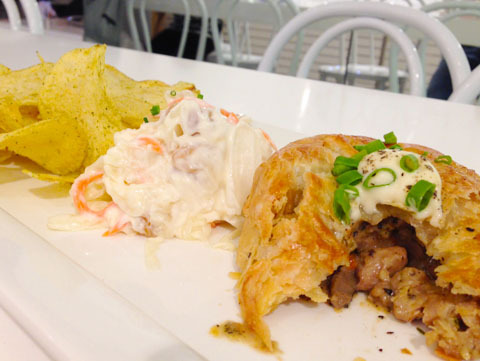 The pie is served with a dollop of creamy coleslaw and a helping of seaweed crisps. The three elements went together surprisingly well and I thought it was a pretty decently priced meal. 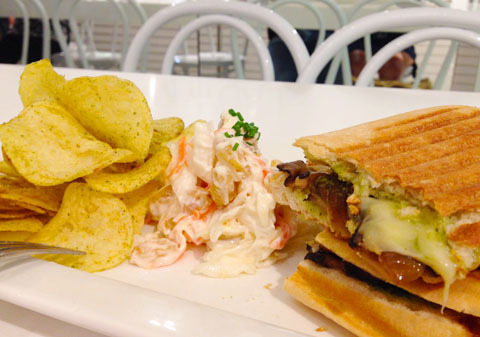 We were seduced with the word “onion jam” in the Mushroom and Onion Jam Panini ($12). The sandwich is reasonably sized, with a generous amount of mushroom and onion jam, with the latter’s flavour really making the whole sandwich. The ooey gooey cheese also really hit the spot! The same condiments (coleslaw and seaweed crisps) are featured. Know what I mean when I say the savories aren’t really their focus? It’s merely something to put on the menu for those that want actual food, but that said, it’s still pretty good. 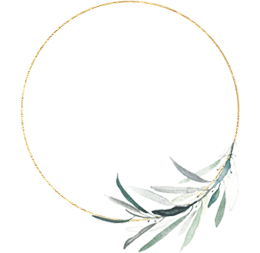 Soooo… many……. cakes!!! This is where Lady M really shines. Gorgeous AND they looked like they’d taste amazing, I had a really tough time as I wanted them all. What a shame they don’t offer a sampler platter of their top sellers – I’d get that for sure. 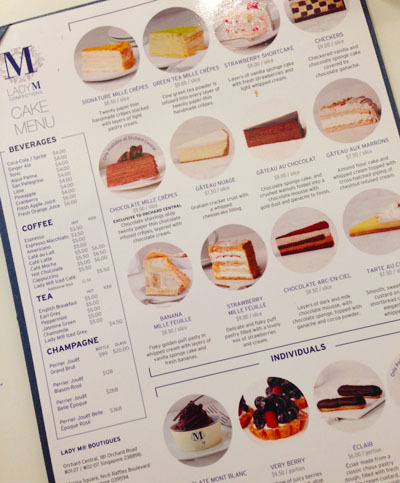 We couldn’t go past their signature world-famous Mille Crepe. 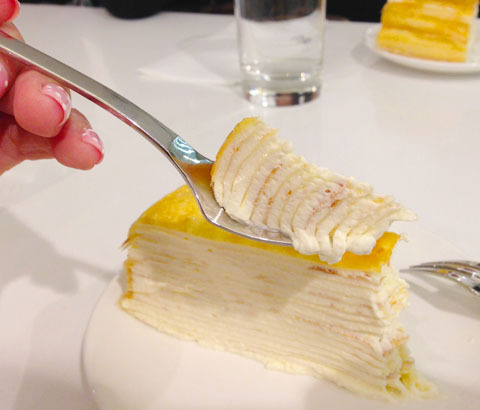 It’s certainly beautiful to look at – with delicate layers of thin crepe and fluffy pastry cream sandwiched between each layer. I can see why people love this, but it didn’t quite hit the spot for me. I suppose I’m not really into cream, so I’d have preferred more of a crepe flavour. Instead, it was like eating spoon after spoon of pure cream. 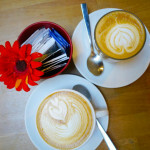 But for those of you that love quality, freshly-whipped cream, Lady M offer the best. This is their dessert counter, with their whole lineup of cakes at the glass window. Don’t go there and look if you have an empty stomach!